It was a winning Saturday for Lucas Van Zandt…and a losing one for HorseTourneys. Van Zandt ($77.60) prevailed in a close battle with James Hall ($76.40) and Craig Horn ($71.50) to take the $22,500 first-place prize in Saturday’s $50,000 Guaranteed game. The operative word here is “Guaranteed”. The event attracted 91 entries at $495 each, meaning we took in $45,045 and paid out the full, advertised amount of $50,000. We at HorseTourneys never intentionally set out to lose money like that. But we do like to be aggressive in offering our players a wide range of tournaments — and that includes guaranteed games. And we feel that if you offer guaranteed games that are never in doubt of reaching the guarantee, then you’re just playing games with your customers. It would be similar to a track advertising a Pick 4 guaranteed pool of $100,000 on a date that has historically attracted Pick 4 pools of $250,000. What’s the point? 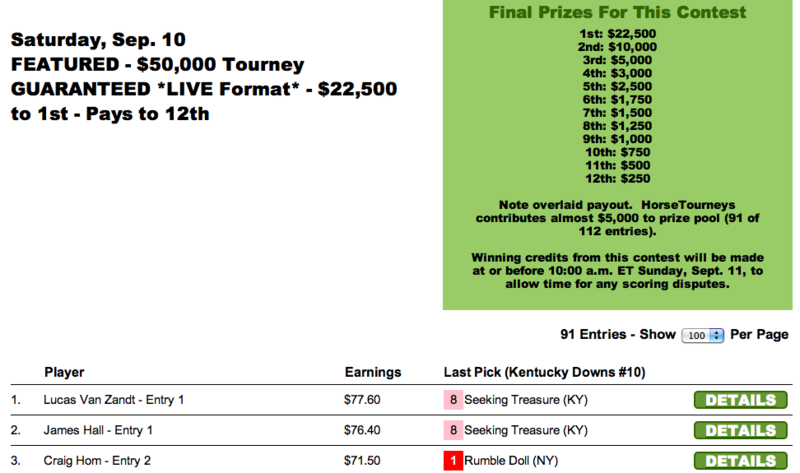 Saturday was another example of HorseTourneys’s undying commitment to treat contest players fairly. And if that means splashing a few Guaranteed pots occasionally. We greatly appreciate what HorseTourneys players have done for us over the years, and we don’t mind returning those favors. It may hurt in the short term, but we think it’s good business in the long term. We also had three exciting direct qualifiers on Saturday that will send people on to key brick-and-mortar tourneys. Mike McIntyre posted a nice score of $98.10 to finish as the convincing winner of our one-time-only Woodbine Mile Tourney qualifier. Armed with a $4,250 package, Mike will do battle this weekend in suburban Toronto. Lindsay Hurst ($90.90) and John Melting ($86.20) each won full packages ($500 entry plus $750 travel) to next month’s Orleans Fall Classic. On Sunday, Les Harris ($95.90) and Larry Burns became the 47th and 48th online winners of The BIG One packages. The BIG One takes place on Sept. 24-25 at Laurel. That means that the final two online seats will be on offer this Sunday at HorseTourneys. The event is capped at 57 players, including up to five “buy-ins” at $9,000 each also allowed. If interested in a buy-in seat, please contact us at support@horsetourneys.com. Steven Turner posted the big score among Sunday’s featured tourneys — $104.90. That tally was good for a $4,500 package in the Nov. 12-13 Del Mar Fall Classic. Scores were very close in our Keeneland NHC/BCBC Challenge qualifier. David Johnson and Peter Osella prevailed in this one with scores of $99.30 and $96.90, respectively. Osella edged out the third place finisher by just $2.00. On the cash side, Scott Krause blasted out to a fast start, hitting winners at odds of 3-2, 12-1 and 7-1 with his first three plays and nursed that cushion all the way to the wire to take the $3,750 top prize in Sunday’s $7,500 Guaranteed game. In our $1,500 guaranteed exacta box game, scores were on the low side. For winner Justin Gray, the big “hit” was a $1 exacta payoff of $46.00 on the 7th at Woodbine. That ultimately was the difference for Gray, who took the top spot and the $600 that went with it. This past weekend at HorseTourneys was yet another reminder that sometimes you need to be great, sometimes you need to be just okay, and sometimes the odds are in your favor if you just show up.